WASHINGTON, March 16, 2017 /PRNewswire-USNewswire/ -- Americans overwhelmingly (95 percent) say health insurance companies should cover emergency medical care, according to a new poll of the public (registered voters) by Morning Consult. These findings are released as President Trump and the GOP-led Congress look to repeal and replace the Patient Protection and Affordable Care Act (ACA). "Provisions currently in the ACA that directly benefit emergency patients must be protected," said Rebecca Parker, MD, FACEP. "Patients can't choose where and when they will need emergency care and they shouldn't be punished financially for having emergencies." When asked if someone visited the emergency department because they believed they were having a heart attack, but were later diagnosed with a panic attack, more than 8 in 10 (83 percent) Americans said that patient's health insurance should cover that emergency visit. The principle of covering medical care based on symptoms that most people would consider potentially life-threatening, rather than the final diagnosis, is called the "prudent layperson" standard. This was codified into federal law, including the Affordable Care Act, following years of denials of coverage for emergency care by health insurance companies. 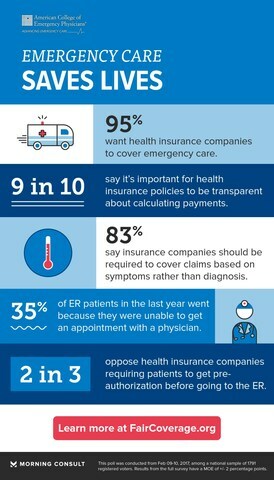 Nine in 10 registered voters said that health insurance companies should let patients know how they calculate coverage for emergency care; with a third (36 percent) saying those payments should be determined using a transparent, independent cost database and formula. This comes at a time when insurance companies are increasingly shifting more of the costs of health care onto patients and physicians by expanding high-deductible insurance plans with ever-narrowing networks of providers. "Emergency physicians are advocating for transparency and use of independent databases, such as Fair Health [www.fairhealth.org]," said Dr. Parker. "The growth of out-of-pocket costs and the reductions of in-network physicians and hospitals are leaving insured people barely covered in an emergency. State and federal policymakers need to ensure that health insurance plans provide adequate rosters of physicians, affordable deductibles and co-pays and fair payment for emergency services. We encourage all patients to investigate what their health insurance policy covers and demand fair and reasonable coverage for emergency care." "Emergency physicians fought long and hard for the 'prudent layperson' standard on behalf of our patients," said Dr. Parker. "Patients should not be forced to diagnose their own medical conditions. It's dangerous. Most people lack the training to determine what constitutes a medical emergency — for example, the difference between the pain in the stomach that is life-threatening and the one that isn't. In fact, physicians can't tell if it's an emergency condition until completing a medical screening exam. Patients should not be put in the position of self-diagnosing at home. Their lives depend on it." Nearly two-thirds (65 percent) opposed health insurance companies requiring patients to get pre-authorization from their insurance company before going to an emergency room. Currently, health insurance companies are not allowed to require pre-authorization from their customers. Nearly one-third (31 percent) visited an emergency department in the last year because of a medical problem they were having. More than a third (35 percent) went to the emergency department because they were unable to get an appointment to see a physician. Almost two-thirds (62 percent) think health insurance costs will increase in the next year. More than a third (36 percent) believes their health insurance benefits will get worse, while 37 percent expect it to stay the same. Emergency medicine is essential to America, providing lifesaving and critical care to millions of patients each year. Emergency physicians represent only 4 percent of all doctors, but provide care for 28 percent of all acute care visits, 50 percent of all Medicaid and CHIP visits and 67 percent of acute care given to uninsured patients. This survey was conducted by Morning Consult with 1,791 registered voters as a national tracking poll on February 9-10, 2017, on behalf of the American College of Emergency Physicians. There is a margin of error of ± 2 percent. For complete poll results, please click here or contact Mike Baldyga at mbaldyga@acep.org.